In the past 20 years, 18 African nations have been ravaged by war. Tens of millions of Africans have been victims of violence or witnessed horrific acts of terror—and now suffer from post-traumatic stress disorder (PTSD). PTSD is a hidden wound of war, crippling individuals and disallowing families, communities, and nations to emerge from the shadow of destruction. Deep trauma can be healed through an easily-learned stress-reduction technique. Victims of violence and war often suffer unimaginable trauma for years, unable to find a remedy for their anguish. These experiences leave an indelible impression in the brain and lead to persistent flashbacks, inability to relate to others, constant fear, hyper-alertness, and frequent outbursts of anger. Those suffering from PTSD need a procedure that reverses this neurophysiological condition. Transcendental Meditation (TM) is a simple, natural, effortless technique, easily learned by anyone—regardless of age, educational background, or walk of life. TM produces a unique and profound state of rest and relaxation, which eliminates stress and restores healthy, coherent brain functioning. The technique does not involve any religion, philosophy, or change in lifestyle. Over 340 published research studies document TM’s ability to reduce stress-related disorders and promote mental and physical health. The National Institutes of Health (NIH) have funded over $26 million in research grants to study its effectiveness. 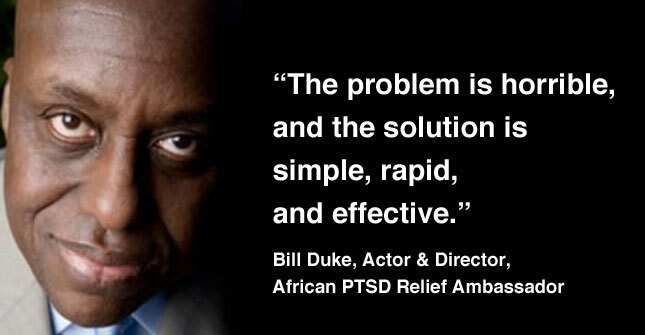 The African PTSD Relief initiative can help survivors of war reclaim their lives by overcoming the effects of traumatic stress and re-establishing a positive state of physical, emotional and social well-being. 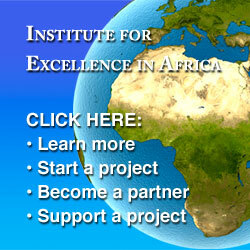 The Institute for Excellence in Africa, in partnership with the David Lynch Foundation and African PTSD Relief, will work with top humanitarian organizations and NGOs to empower the victims of decades of war in Africa. By giving people the ability to overcome the traumatic stress and overwhelming suffering in their lives, they experience a rapid rise in health, happiness, and success. Now more than ever we are aware of the impact of post-traumatic stress disorder (PTSD) on refugees and those affected by on-going conflicts throughout Africa. PTSD is a hidden wound of war, crippling individuals, families and communities who are struggling to emerge from the dark clouds of violence and destruction. Victims of violence and war often suffer unimaginable trauma for years, unable to find a remedy for their anguish. These experiences leave an indelible impression in the brain and lead to persistent flashbacks, inability to relate to others, constant fear, hyper-alertness, and frequent outbursts of anger. These traumatized individuals often respond poorly to traditional treatment with drugs aimed at adjusting levels of brain neurotransmitters which in part mediate the abnormal response to stress. PTSD is characterized by repeated re-experience of traumatic events, avoidance symptoms, including reluctance to think or talk about the trauma, and excessive arousal symptoms, including poor sleep and poor concentration. What is the biologic basis of this disorder? Though all of the puzzle pieces have not yet been put together, we do know that certain parts of the brain responsible for explicit memory (ie. the verbal memory of the event) and emotional reaction do not function normally in people afflicted with PTSD. 1. The gateway of memory, the hippocampus, located near the undersurface of the brain, is reduced in size in many PTSD patients, apparently because of the negative effect of stress hormones on the nerve cells that make up this structure. The result is memory impairment and amnesia for some events. 2. A neighboring structure, the amygdala, is abnormally activated in PTSD. 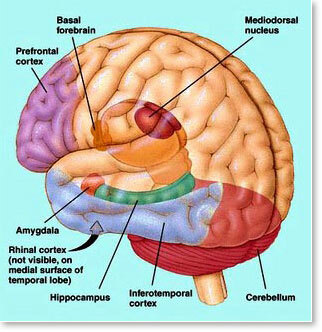 The amygdala infuses memories with strong emotion, and its excessive activity can trigger anger and rage reactions. 3. The prefrontal cortex, the seat of judgment and planning, thought to act as a counterbalance to the impulsive amygdala, is also negatively affected in PTSD. PTSD has traditionally been treated like other anxiety disorders characterized by episodic flare-ups, which are incapacitating. Drugs aimed at treating both anxiety and depression are utilized, as are behavioral therapies, all with limited success. 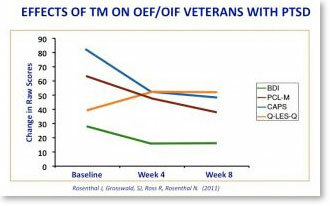 By the fourth week of practicing TM, OEF/OIF veterans with PTSD experienced dramatic reductions in PTSD symptoms according to the Clinically-Administered PTSD Scale (the gold standard of PTSD testing). They also reported decreased depression and improved quality of life—showing a greater ability to return to their lives after the war. These findings replicated an earlier study examining TM as a treatment for Vietnam veterans with PTSD. The recent pilot study showing a 50% reduction in PTSD symptoms in veterans practicing Transcendental Meditation fit with what is known about TM and how it affects the brain. During TM, the EEG changes reflect prefrontal cortical activity naturally and effortlessly increasing in power in a coherent manner. The state of restful alertness during TM is exactly the opposite of what is seen with amygdala over-activity. And, these EEG changes are seen during TM even in new meditators, so a few weeks or months of practice can be expected to significantly reduce the negative impact of repeated episodes of emotion-laden memories. The memories are not erased, but they are less likely to overwhelm, as this new style of a more coherent cortical functioning is established in the brain of someone practicing TM twice a day. What a great addition this is to physicians treating these wounded individuals affected by PTSD and anxiety disorders. It is the goal of the Institute to make it available to those in need. Neurobiology of Posttraumatic Stress Disorder; D. Jeffrey Newport and Charles B. Nemeroff; Focus 1:313-321 (2003) Am. Psychiatric Assoc. Dr. Gary Kaplan is a neurologist and Associate Professor of Clinical Neurology at Hofstra University School of Medicine. Dr. Kaplan received the Albert H. Douglas Award from the Medical Society of the State of New York for outstanding achievements as a clinical teacher interested in promoting and improving the medical education of physicians. He is also a nationally recognized expert on the effects of the Transcendental Meditation program on stress-related illnesses, and he appears regularly on CNN, NBC and CNBC and other national television programs speaking about the latest research on Transcendental Meditation and its effects on health.